Bengaluru: The Defence Ministry on Saturday announced that the next edition of the Aero India air show would be held here from February 20 to 24, 2019. 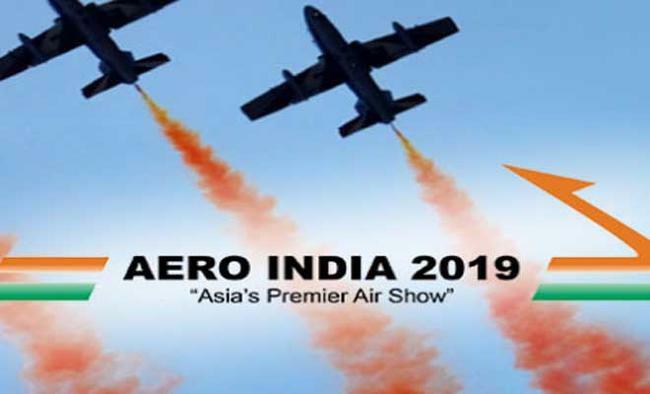 "The government has decided to hold Aero India 2019 in Bengaluru from February 20 to 24, 2019," said the Ministry in a statement from New Delhi.The 12th edition of the five-day biennial event will be held at the Yelahanka base of the Indian Air Force (IAF) on the city's northern outskirts amid tight security. "The trade event will showcase technologies and products of global and Indian aerospace and defence firms, with static and flying display of military and civil aircraft, including fighters, jets, helicopters and air weapons. "Besides global leaders and investors in the aerospace industry, think-tanks from the world over will participate in the show, providing an opportunity to exchange information, ideas and new developments in the industry," said the statement. "The air show will also give fillip to the domestic aviation and further the cause of 'Make in India'. The defence production department is committed to ensure a result-oriented air show," the statement added.The Karnataka government has welcomed the Ministry's decision to hold the air show in Bengaluru only. "It's a great relief that the air show is not moving out of the city, which is also the country's aerospace hub. We thank the Defence Ministry for the right decision," a senior official in the Chief Minister's office told here. The official confirmation on continuing the air show in Bengaluru came within a month after Chief Minister H.D. Kumaraswamy wrote to Prime Minister Narendra Modi to hold it here as in the past two decades. "I seek your intervention for conducting the 12th edition of Aero India-2019 in Bengaluru, where the mega event was held for 11 times biennially since 1996," said Kumaraswamy in a letter to Modi on August 13. Apprehension over shifting the event came to light following recent media reports that the Ministry was mulling to hold it at Lucknow, Uttar Pradesh, with an "eye on the general elections due in April-May 2019" for the ruling party (BJP) at the national level. "As the hub of defence and aerospace majors in the country, Bengaluru is the most suitable place to conduct Asia's premier air show, as evident from the huge response it got from the world over in the last 22 years," noted the letter.In the 11th edition, held in February 14 to 18, 2017, 549 global and Indian firms from 51 countries participated. "Bengaluru has become synonymous with the air show for which the defence ministry and the state government had invested in upgrading infrastructure, including the air base, roads, highways and public amenities," said the letter.Union Minister for Parliamentary Affairs Ananth Kumar also said in a tweet on August 13 that Defence Minister Nirmala Sitharaman had clarified to him that no decision was taken to shift the air show to Lucknow from Bengaluru.